Is the M9 about to get a bigger brother? If you've not yet had your fill of new phone releases yet this year, there could be another one to look forward to in the slightly larger shape of the HTC One M9+. It's a device that's been unofficially talked about for quite some time. Now there's new grist for the rumour mill courtesy of serial tipster @upleaks, who says that this handset is on its way to the consumer market and will be appearing in Europe in the near future. Sounds like it's going to be the M9+ and not the M9 Plus then - HTC trying to distance itself from Apple's iPhone line or showing a sudden affinity towards Google's flagging social network? You decide. 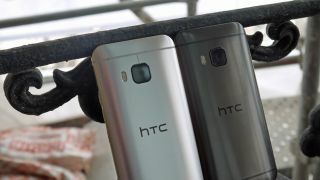 It was originally believed that the bigger version of HTC's 2015 flagship would be confined to Asia but it now looks like Europe is included too. The key differentiator would be a 5.5-inch screen rather than the 5-inch on the M9. We're also hearing that a MediaTek chipset is going to be used inside the phone instead of the more expensive Qualcomm one found in the HTC One M9 we've already seen. Most of the other specs will be along similar lines. If you're a fan of the HTC One M9 but are eager for a little bit more screen space then this could be the phone you've been waiting for. As yet there's been nothing official from HTC, but @upleaks has a good track record for providing accurate information about the Taiwanese firm.